Brand new high quality extendable Wheel Brace Wrench Telescopic Car Van Socket tyre Nut 17, 19, 21, 23mm. That will fit all Cars with factory fitted wheels. The Wheel Wrench has 2 different sockets supplied, and each socket has two sizes. A great quality tool and built to last. This handy space saving wheel nut wrench is a must have tool for every car owner. This telescopic wheel brace is perfect as a compact solution to keep in your car in case of any emergencies. 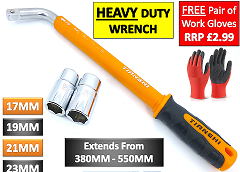 This telescopic wheel wrench extends to nearly twice its size for super performance on tight nuts. Telescopic Wheels brace, saving space and very convenient to use. Sturdy, light and solid construction. Fitted with strong toughened non-slip rubber handle for extra grip and comfort. High torque extending handle for easy use and extra power. Its instructions are easy to learn and understand.